My four pet yeasts... Well, that's what Terri calls them. Over a month ago I poured the slurys off a couple of batches when bottling. They went into the fridge, and in the fridge they stayed, until a few days ago. Over time refrigerated yeast will loose it's viability, and give way to other bacteria that may have been introduced into the system. After about a month brewers yeast is only about half viable. 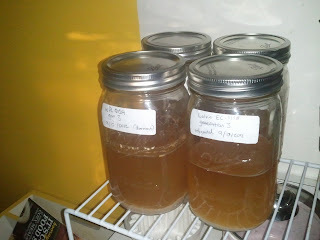 (1) These two different yeasts had been sleeping in the refrigerator for about a month, so it was time to wake them up. There wasn't a new brew to pitch them into, so I made some small starters to create some new cells. It cost about a dollar to make two pint starters, so with the cost of a vial of yeast of over seven dollars this can be done six or seven times and still be saving money. Six generations is also about as long as recommended to use them. We've enjoyed using these yeasts in our brewing. The Lalvin made a wonderful dry cider with a champagne taste.